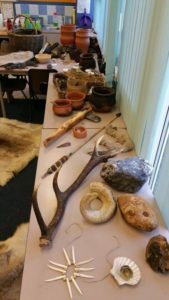 Specially designed for the new National Curriculum, we offer our wonderful and stimulating educational sessions looking at life in the Stone Age – from the Palæolithic through to the Neolithic period. We encourage children to come dressed up for the day. Two Stone Age people arrive from two rival tribes, in period clothing, with painted faces, objects, tools and weaponry. Children are split into two- or three- tribes and have face paints* applied as either ‘dire wolves’, ‘sabre-toothed tigers’, or ‘cave bears’. We start our study with the concepts of language and communication- what and how did they communicate to each other, emotions, gestures, noises, art. We introduce them to the concept of life in a cave and roundhouse, with a central hearth. We show how fire was made. What was the most important stone used for making tools? Children get the chance to handles furs and hides, antler, flint and see how tools evolved. What did they wear? A hunt for food is acted out – understanding tracking, trails, pits traps and snares, the use of spears, bow and arrow and fishing trident. Ancestor worship, burial practices, average life expectancy, shamanism and medicine. We have NATIONWIDE COVERAGE to enable us to deliver our school workshops across the country, where-ever your school is located. From Suffolk to Anglesey, Isle of Wight to Scotland, we make history happen!